Ford seems to think the luxury truck segment an untapped market. And it may just be right. Somewhere in the unwritten rulebook passed among automakers is a clause that says, “Don’t make upscale trucks.” For one reason or another, every automaker that’s tried to do so has failed. It’s not like many have. FoMoCo used to rebadge the F-150 and sell it as a Lincoln Mark LT and Cadillac once got away with an Escalade EXT based off of the Chevy Avalanche. Both are now dead and gone, and since Mercedes won't sell America the X-Class, we must rely on special edition trucks to feed that appetite. Ford hasn’t given up just yet, however, because it took time to announce a new Limited series of its Super Duty trucks aimed straight at the successful person with heavy duty needs. 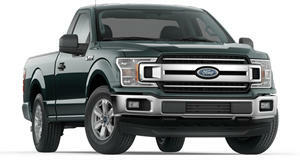 Unfortunately this doesn’t mean that the F-150 is getting a high-dollar makeover. Ford only seemed to keep high-end customers with heavy duty towing needs in mind when it designed the F-250, F.350, and F-450 Super Duty Limited. In the press release, it specifically calls out boat captains as well as “captains of industry” as the target market. Think owners of small towable yachts or multimillionaire CEOs of construction and contracting businesses who have gotten accustomed to the high life. These kinds of people want to experience that lifestyle in scenarios where a Bentley Bentayga diesel or plane-towing Porsche Cayenne Turbo are simply not capable enough. “The Super Duty lineup is a win for all of our customers, from successful ranchers to contractors to RV owners,” said Todd Eckert, Ford Truck group marketing manager. “Super Duty Limited is the most luxurious and advanced heavy-duty pickup truck ever created by Ford for accomplished buyers, with appetites for the high life and hard-earned dollars to match.” The interior cabin amenities that these trucks receive include custom Camelback two-tone leather seats, stitched leather-wrapped steering wheels, suede headliners, ash wood trim, and special badging. Not like Ford skimped on technology either. Standard features include adaptive cruise control, adaptive steering, a 360-degree camera, SYNC 3, lane-keep assist, a panoramic moonroof, heated and cooled seating surfaces, and a heated steering wheel. The Limited spec also raises the price considerably. The F-250 Super Duty Limited starts at $80,835 (a base F-250 is only $32,890) while the F-350 Limited and F-450 Limited start at $82,010 and $87,100 respectively. Take the F-450 Limited and tick off every box on the options list and you’ll hit a cushy $94,455. Yep, that’s just shy of $100 grand. For a truck. With about as much chrome on the large grille as the Mark LT, you won’t miss that Lincoln badge one bit.